As regular readers of this blog will know, I love a good musical, both on the stage (when I can get to see them) and film versions. Last weekend I had the flat to myself as N had gone to visit his dad and our flatmate T was up in Lincoln, so I bought myself a pizza, opened a bottle of wine and sat down and watched a film the boys would hate. That film happened to be Rock of Ages, which I've wanted to see ever since the musical was first announced as coming to the West End stage. Director Adam Shankman has become something of an expert at adapting stage musicals for the silver screen (he also directed the 2007 version of Hairspray) so I have to admit I was looking forward to this a lot. The film is largely carried by the sweet performances from relative newcomers Julianne Hough and Diego Boneta, with the more major actors left to inhabit the roles where they're allowed to let go a lot more. Particular highlights for me were Dennis and Lonny singing REO Speedwagon's 'Can't Fight This Feeling' to each other - one of the main moments where I actually laughed out loud rather than just chuckling regularly - and Tom Cruise's performance as Stacee Jaxx, which is completely over-the-top but also genuinely entertaining. He doesn't have a bad singing voice either. In fact, surprisingly, none of the cast does - no Mamma Mia! moments here, although it's not exactly Hairspray in terms of the talent on show or the issues in the story (though apparently it's been altered quite a lot from the stage show so I'd be interested to see both to compare and contrast). Overall, it's ridiculously silly and the plot is fairly predictable, but Rock of Ages is a really fun ride, mainly because of the great music - I was singing along to pretty much the whole thing! - and Tom Cruise's film-stealing and surprisingly good performance as Stacee Jaxx. I'm not sure I'd have paid to see it in a cinema but as a trashy film for a night in it's definitely worth a watch. I watched Rock of Ages via Blinkbox, which is currently giving new members £5 when they deposit £1 (meaning the film only cost me £1.99, result! ), but you can also buy the DVD for £5 from Amazon if you fancy checking it out. 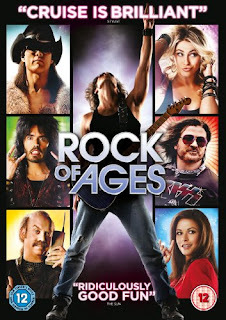 Have you watched Rock of Ages - either the stage show or the film? What did you think of it? And do you have a favourite musical? Let me know in the comments and have a great day!